Compared to gold or ivory, porcelain veneers are recent in dental procedures. Often misspelled as porcelin veneer or porcelain vaneer, this form of dentistry is extremely popular. As dentistry and dental technology has continued to advance, the application of teeth veneers has altered to suit the individual. Porcelain dental veneers have benefited from the change in tastes and advances in dental technology. Prior to the appearance of porcelain and ceramic veneers, teeth replacements were made from bone (ox and even human), gold, and wood. One of the more popular restorative materials was ivory. Ivory was comparable in whiteness to a tooth. It was relatively tough. But ivory was not natural in appearance. It was also susceptible to different oral problems. It's use began to wane in the late 1700s. Porcelain used in dentistry has been around since the 18th century. Alexis Duchateau (1714-1792) discovered the method in 1744. Yet, it was not until French dentist, Nicholas de Chemant found a solution to the problem of shrinkage, common during the firing process, that porcelain used in dentistry started to become more standard. The result was both hard-baked and rot-proof dental restoration. He took his discovery with him to England during the French Revolution. 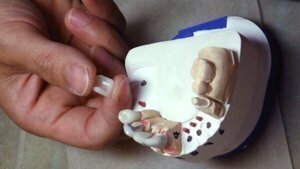 In the beginning porcelain restorations were used primarily with dentures. But this was the groundwork necessary that used porcelain in other dental procedures, including dental veneers. In 1808, an Italian dentist, Giuseppangelo Fonzi, devised a single tooth application from porcelain. A platinum pin imbedded the porcelain tooth, holding it in place. In America, several technological advances came about. Charles Peale (1741-1847), an American artist and not a dentist, experimented with baked mineral teeth (porcelain, ceramics). Samuel Stockton established a commercial venture to make these available to the public. But porcelain continued its use in dentures. In Hollywood, during the 1930s, California dentist Dr. Charles L. Pincus (1904-1986), developed the process which revolutionized cosmetic dentistry. He molded porcelain into the shape of a tooth, and then using denture adhesive, glued it to the outside surface (lingual) of a Hollywood starlet's teeth to temporarily improve her smile. This was the first porcelain veneer. It was rudimentary by today's standards and was a temporary fix to an unattractive smile. It took almost 50 years (~1980s) for the process to gather momentum when porcelain etching became a feasible and dependable process. This technique brought to market powerful adhesives that make today's veneer dentistry a reliable treatment. Porcelain, and the research and development into modern ceramics and adhesives, has given dentists, dental technicians, and patients many more long lasting options to get the aesthetic look they desire; while also improving form, function, and oral health. When Does Dental Insurance Cover Veneers and Cosmetic Dentistry? How Do I Find Discounts With Dental Savings Plans?